Plastic pollution is one contributing factor towards the damage caused to marine life. It makes up around 60 to 90% of all marine debris, this number of plastic does not decompose and therefore is being consumed by sea animals. Plastic is constantly being created for products that consumers buy due to its convenience for example the use of straws, plastic water bottles and single use plastic bags. Annually 100 million tons of plastic is created globally and 25 million tons of this is disposed into the environment. The continuous use of single use plastic products contributes towards plastic pollution as they are used once and will never decompose. Recycling plastic is an efficient way to not waste plastic however it does not cut down on plastic, it is simply remodelling it. Consumerism alongside the growth in population and urbanization contributes towards the increase in plastic pollution. Companies continuously produce products using plastic as it is extremely cheap and therefore they can keep up with the demands of consumers. 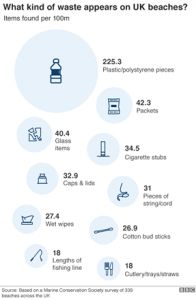 This artefact produced by the BBC, shows the number of single use plastic that turns to waste. Products such as wet wipes, plastic bottles and plastic packets are discarded on UK beaches which eventually pollutes the ocean. It is impossible to know where all plastic originates from, however the BBC also found that the public contribute around 30% towards plastic pollution found in oceans. Items flushed down the loo, which should have been disposed of correctly amounted to 8.5% of the pollution. Ground water pollution and land pollution are also damaging to the planet, which is caused by plastic waste. Once plastic pollution seeps into the world’s water it becomes extremely damaging to the environment and humans as it could be found in drinking water. Often when there is heavy wind and rain stray pieces of plastic get washed into water reservoirs, oceans and drains which adds to the decrease of water quality and an increase in pollution to oceans. Most of these toxic fluids come from the large amount of plastic waste dumped into landfills. Once these harmful chemicals enter the ground they begin to decrease the planet’s water quality and could put those who drink it at risk. The plastic pollution is also unable to be burnt, to decrease the waste, as it releases harmful chemicals into the environment. Plastic pollution is only one growing problem that needs to be prevented in order to improve our environment. The government alongside corporate companies who constantly produce products using plastics need to make drastic changes in order to help our marine life and our planet, before it’s too late.